CUBA STANDARD — Accompanied by his government’s top economic managers, President Raúl Castro landed in a Cubana Il-96 jet at the Paris-Orly airport Saturday afternoon, two days ahead of the official beginning of a visit of France heavy on finance, trade and investment. The Cuban team for the five-day visit to France — the first ever of a Cuban president — includes Vice President Ricardo Cabrisas, Cuba’s point man for strategic economic relations, and Foreign Trade and Investment Minister Rodrigo Malmierca, as well as Foreign Minister Bruno Rodríguez and Deputy Foreign Minister Rogelio Sierra Díaz. Castro’s visit follows that of French President François Hollande to Havana in May. 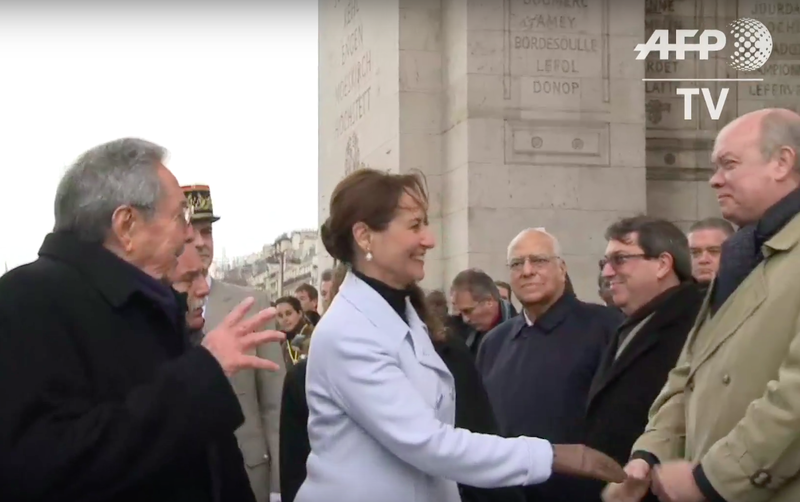 The official agenda begins Monday at 10 am with a high-profile welcome under the Arc de Triomphe by Ecology, Sustainable Development and Energy Minister Ségolène Royal. At 5 pm, Castro will meet with Hollande at the Elysée palace, followed at 6 by signing of bilateral agreements — covering trade, investment, transportation, tourism and development — and a joint press conference. The day will end with an 8 pm dinner at the Elysée. On Tuesday, Castro will meet with the general director of UNESCO, the president of the National Assembly, president of the Senate, the mayor of Paris, and Prime Minister Manuel Valls. Finally, Castro will tour the Musée de l’Homme, an anthropology museum reopened last year after five years of renovations. The Paris Club of creditor nations recently agreed to forgive Cuba $8.5 billion of a $11.9 billion debt dating back to a 1987 default, granting easy terms for payment of the remaining $3.4 billion. As Cuba’s biggest creditor, France “played an essential driving role” in reaching the agreement, according to French Finance Minister Michel Sapin. France agreed to forgive $4 billion in accumulated interest; Cuba will pay France $240 million of its $470 million in principal and original interest debt, and France agreed to convert $230 million into new development projects in Cuba. The French development agency AFD will resume “very rapidly” its activities in Cuba, Sapin said. Citing a French diplomat, Reuters reported AFD is expected to sign an agreement setting up an office in Havana. French companies have been jockeying for position in Cuba as U.S.-Cuba relations are thawing. Bilateral trade was at a modest $195 million last year, but the amount is expected to grow as the French trade credit institution Coface boosts coverage of Cuba, from its current euro 90 million. This entry was posted on Monday, February 1st, 2016 at 4:29 am	and is filed under Economy. You can follow any responses to this entry through the RSS 2.0 feed. Both comments and pings are currently closed.